Basta ir até o 50.57, 51.46 terá uma pedra para clicar. / Go to 50.57, 51.46 will have a stone, just click. Go to 50.57, 51.46 will have a stone, just click. Anyway, no need to find Beatface. Go to the place on the map, you'll find a boulder. Click on it and Beatface will magically appear and whack the boulder. Then you turn in your quest. When clicking on the boulder, I got the error message "You need Beatface the Sparring Arena gladiator to break this!" For the quest I chose to build the Sparring Arena. Then I immediately went back to the boulder and this time Beatface came over and smashed the boulder. 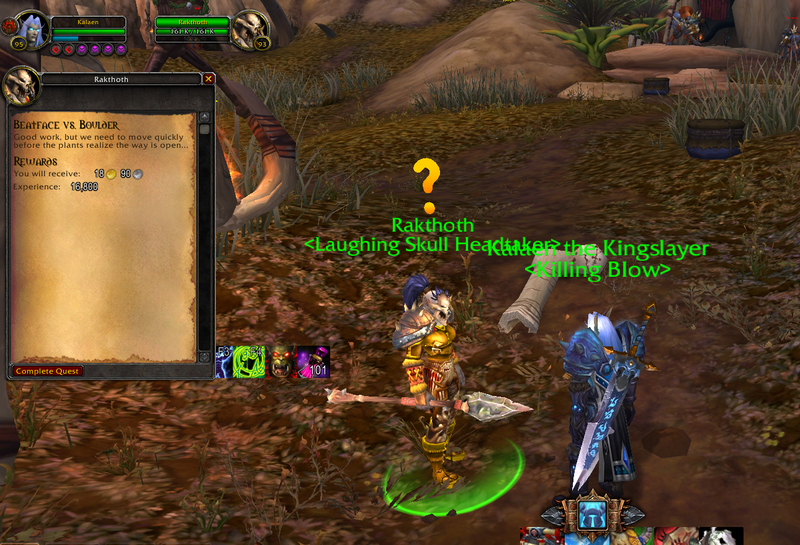 Quest is bugged like so many others. You just run through the barricade currently, there's no resistance and no Beatface. To turn in, you're going to drive yourself crazy popping in all the caves, getting dismounted, stuck in combat and running on foot looking for the NPC(Rakthoth) associated with the '?' on your minimap because she hasn't actually spawned in yet! On my 3rd alt here now, it looks like after you run through the barricade, enter the camp, drop down the mountain out of the camp, then run back through again, the NPC for turn in spawns where you went the first time, chasing down the original '?'. I've never seen Beatface on 3 chars, working on 4th this week, and I'll update if necessary. The quest isn't bugged, but you need to go to the boulder, which is not in the same place as the weeds (which you'd be cutting through if you had chosen the lumberyard instead.) The boulders are at 50.61,51.44. From the quest giver, leave the cave and go LEFT instead of right; there is a trail with a red banner over it heading up the mountain that brings you into a spot full of dead podlings. If you have bugged quest - simple jump thru place on screen. Quest is not bugged. You either complete this using the Shredder (Lumber Encampment) or with Beatface (Sparring Arena). You will be guided to the vines with the Shredder; to the rock with Beatface. Altuur is not at the cave. I done every quest before it. Any suggestions? Rompa a barreira de penedo usando Carantonha, o gladiador. Uma das entradas está coberta com um enorme penedo. Grande demais para mim e para ti, mas talvez um ogro com um martelo consiga parti-lo. Creio que tu sabes de quem estou falando. You have strong friends <name>. We must make haste before the plants realize the way is open.